It goes without saying that the way your home looks is a reflection on you. If your marble or other natural stone countertops are showing signs of wear, such as etching, chips, and the like, it’s time to give Heaven Sent Floor Care a call. Don’t allow just anyone to refinish your expensive counters. Marble countertops are an investment and quality refinishing takes professional skill and years of experience. From a technical standpoint, it’s one of the more difficult refinishing tasks for craftsmen. At Heaven Sent Floor Care, our craftsmen carefully select the proper tools and grit progression to make sure scratches and etches are safely removed from the surface. Experience is critical, which is why we only hire the best. When you choose Heaven Sent Floor Care, you’ll receive professional service from start to finish. We’ll refinish your marble counters in your home without the need to remove them. A professional, trained stone refinisher will be sent to your home at a date and time that’s convenient for you. Before we begin, your technician will assess the condition of your countertops and determine the appropriate level of refinishing needed. After your countertops are refinished, your home will appear as we found it. You’ll have shiny, beautiful countertops with no extra mess to clean up. Why Do I Need Marble Counter Restoration? Marble polishing including etching are quite often miscomprehended. Those dull “water spots” as well as “glass-rings” (etch spots) are undoubtedly baffling. And in most cases consumers hold misleading beliefs and have incorrect opinions about how you can polish marble or even how marble polishing is in fact accomplished to create a shiny surface finish. Etching (not a “stain”) on marble countertop. Quite a few are convinced that the luster or polish on marble results from buffing or spreading a sealer, cream or chemical substance during marble cleaning. Likewise, some believe that all marble is intended to be glossy and that the dull etch marks are some type of “stain”. Unfortunately, barely any of the aforementioned holds true, yet some of it is not necessarily completely false either, which necessitates some clarification below. Marble (travertine, limestone and any “calcite” stone too) is quite sensitive and reactive with certain types of foods, products and chemicals, which can damage the surface finish leaving dull and/or lighter-colored whitish spot often described as a “water spot”, “water stain”, “glass-ring”, or “ghost stain”. Therefore, if you spill acidic orange juice (or any of the many other acidic foods and beverages) on marble it absolutely will corrode the surface. This corrosive chemical reaction will essentially eliminate the shiny surface layer achieved from the marble polishing process described above revealing the dull marble underneath. Nevertheless, permit me to explain the subtle distinction that occurs with the issue of etching. Marble (travertine, limestone and any “calcitic” natural stone too) is sensitive and reactive with a number of kinds of food items, products and chemicals, which in turn can easily harm the surface finish resulting in dull and/or lighter-colored whitish area frequently described as a “water spot”, “water stain”, “glass-ring”, or “ghost stain”. Thus, if anyone spill acidic citrus juice (or any of the numerous other acid based types of foods and beverages) on marble it definitely will corrode the surface. This particular corrosive chemical type reaction will essentially eliminate the glossy surface layer attained created by the marble polishing process explained in this article revealing the dull marble underneath. 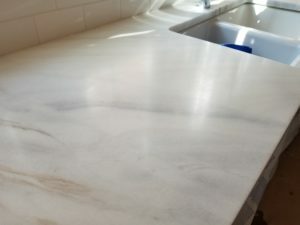 If you use the wrong products for cleaning marble (too acidic or too alkaline) you can destroy the shiny finish over the entire surface making your whole marble countertop or floor “dull”. Etching commences on contact and the longer the exposure the more unpleasant the etching. And sealing does not stop etching. You need to protect against contact with the reactive substances. An etch spot is not a stain. Absolutely nothing has absorbed into the marble. Also, plain h2o (unless acidic like a number of well and city water reserves) does not trigger it. Etching and staining are two completely different processes. One may hear or read that “marble stains easy”. Believe it or not marble does not stain easily it “etches” quickly and many (including a large number of in the natural stone profession) don’t understand the difference. Hopefully from reading the above explanation the vast majority of individuals are going to agree refinishing a marble top is not a DIY project.